Zvakanaka Farm - Makhado (Louis Trichardt) Accommodation. Igababa Cabin and Madala's Cottage, are located on Zvakanaka farm. 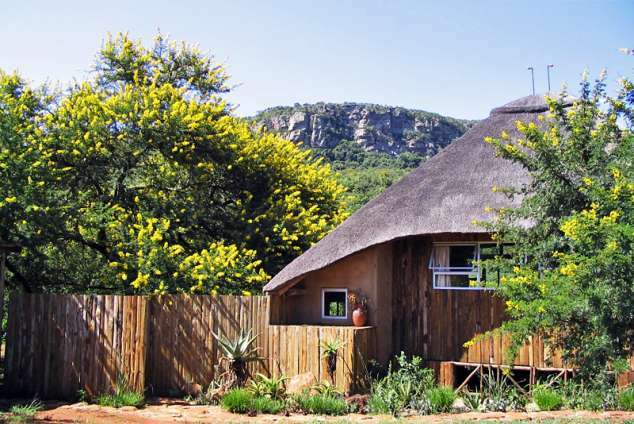 This cool spot in the Soutpansberg mountains is perfectly situated, both for people wanting an easily accessible destination for a tranquil escape, and for those who need a base from which to explore the richly diverse surroundings. Being placed close to the N1 and just 11kms north of Louis Trichardt (Makhado) it is also ideally situated for businesspeople who are tired of hotel and bed & breakfast stays. Igababa Cabin: Although Igababa Cabin is particularly popular for romantic getaways, it is also popular for birders and nature lovers. Viewing raptors soaring above the cliffs from your bed is hard to beat and some of the guests have found birding from the outdoor double bath a very pleasant and unique experience! Our guests really enjoy the fact that, even when you are indoors, because of the large expanse of glass, you feel as if you are out there - at one with nature. The setting of Igababa is very private and not a single building or light is visible from the front of the cabin. Please note the cabin only sleeps two in a double bed. The cabin consists of a large bedroom/living area with a separate kitchen and bathroom. The bathroom has a toilet, basin and shower. Under the trees, outside the bathroom, with a stunning view of the mountains, is a luxurious oval double bath - delightful even when the mist comes down! The cabin sleeps 2 in a double bed. It is electrified and fully equipped for self-catering: all the cooking utensils you need; a four-plate gas stove; a microwave oven; kettle; toaster, etc. A free standing fireplace ensures cosy times when the weather is cold. There is also a heater for those who prefer. There is a large timber deck off the front of the cabin and a braai area adjacent to the kitchen, under a thorn tree with a braai stand and ground fireplace. There is a black 2m x 3m wallow pool off the veranda. The cabin is a no-smoking zone, smokers are kindly asked to smoke outside. We regret no pets allowed. There is a radio/CD/cassette player and a TV. Madala's Cottage: Madala's cottage is ideal for a small family, and in fact we built it because of the demand for accommodation for children - but it is equally delightful for couples! The cottage has a large main bedroom with a double bed, with its own en-suite toilet and separate shower. Leading from the shower, through sliding glass doors, is an outdoor shower and double bath in a delightful enclosed garden. This garden has large doors which can be opened to give wonderful views of the trees and mountain and guests are totally private. If a cozier feel is preferred then the doors can remain closed. The second bedroom is small with two single beds. This bedroom has access to its own shower and toilet. Both bedrooms have wall panel heaters. The living room is open plan with the kitchen and dining room and there is a fireplace. It is fully equipped for self-catering and all you need bring is your food and drink. All the cooking utensils you need are provided; there is a 4 plate gas stove, a microwave, fridge with small freezer kettle; toaster, etc. a braai stand outside and a fireplace on the ground. A generous amount of firewood is provided. Madala's Cottage has a small swimming pool. The outside social area is adjacent to a beautiful orchard of large pecan nut trees which give wonderful shade in summer and dappled shade in winter, there are also stunning views of the mountain from here. There is a radio/CD player and a TV. Although not as secluded as Igababa, Madala's is very private. General: There are numerous trails cut on the farm and, depending on how much energy you want to exert, you can either take gentle strolls or more serious walks to the very top of the mountain where there are stunning views in all directions. All you need to bring is your food and drink. Tea, coffee, sugar, salt and pepper are provided as are tin foil and clingfilm for the microwave. For those who would prefer not to self-cater there is an hotel, with an a la carte menu, within 5 minutes drive from the farm and the town of Louis Trichardt is only a 15 minutes drive. Both cottages have a generous amount of firewood provided, together with firelighters, candles and matches. If you need harder wood for coals or charcoal you will need to bring that yourself. To ensure your privacy, the cottages are not serviced. Servicing on weekdays can be arranged for a small charge. Linen and towels (bath and swimming) are provided. Both cottages have TV's with full bouquet DSTV. Vodacom and CellC reception is good, MTN reception is poor. The two cottages are set far from each other and cannot be seen by each other; guests have their own locked entrance and can come and go as they wish as they have the combination to the lock. 22602 page views since 02 Aug, 2007. Last updated on 18 Sep, 2018.